Unique floral arrangements, silver napkin holders and silk scarves are just some of the luxuries master perfumer Roja Dove goes in search of in and around Bond Street. In between signing copies of his latest book; The Essence of Perfume at this month’s launch in The Fumoir at Claridges, he reveals five of his favourite haunts. I would never forego a trip to Hermes. My collection of scarves represents different points in my life and instantly transports me back to how I was feeling when I bought them… In the same way that scent unlocks the floodgates of memories. Kally Ellis is a genius! No wonder she arranges the flowers for the Vanity Fair party at the Oscars each year. It’s great that she’s now in the centre of London as I can always have her creations around me. I wouldn’t dream of going anywhere else whenever I need flowers for an event. The ultimate secret! This atelier produces some of the most beautiful bespoke crocodile pieces in the world. Relaxing at the end of the day in one of the winged leather chairs, glass of champagne in hand is one of life’s little luxuries. I’m proud to say that I have created a perfumed candle for the hotel, which encapsulates the way The Connaught wraps its arms around your senses. Asprey, 167 New Bond Street. An exquisite example of British excellence. 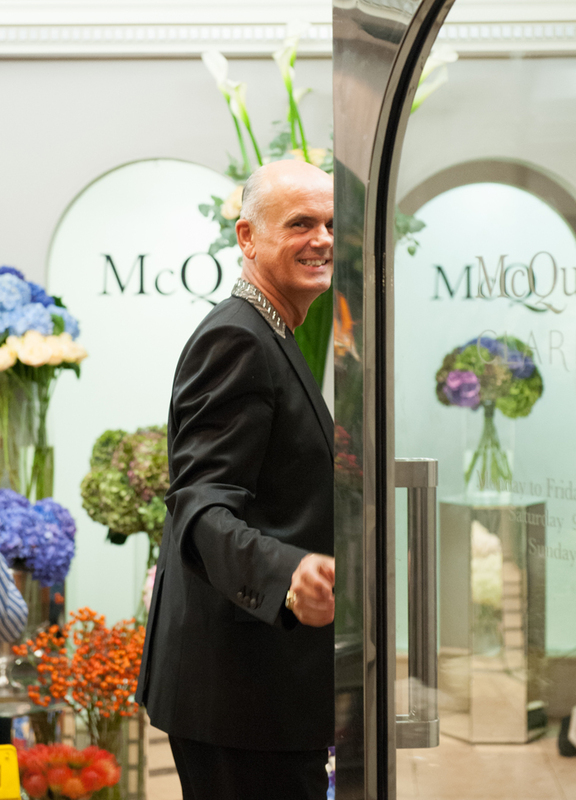 As soon as I step foot into the store, I’m met with impeccable service and unrivalled craftsmanship. I recently bought napkin rings, and I can’t imagine throwing a dinner party without them. There are plenty of good reasons for wanting to visit London right now. But to discover all the amazing things it has to offer – its vibrant art scene, fashion, culture and food – you need to be in the thick of it and Brown’s Hotel which sits proudly in the heart of Mayfair is the place to be. This is a hotel of firsts. It was the first hotel to open in London in 1837. It also boasts the first successful telephone call made in Britain by Alexander Graham Bell in 1876. And both Agatha Christie and Rudyard Kipling were so inspired that they penned many of their novels whilst staying here. And who knew it had two entrances; one on Dover Street, the other on Albemarle Street, adding another element of intrigue. Recently redesigned by Olga Polizzi, Director of Design for Rocco Forte Hotels, the group, which owns Brown’s, the interior has never looked better. The results are pure class – this is a five-star establishment after all – but there’s also a modern home-from-home quality about the rooms and suites thanks to a clever mix of antiques and contemporary furnishings. The colour palette includes shades of orange, peppercorn red and lime, while the British artworks, which hang in every room, add a further pop of colour. The beds are supremely comfortable and the service is impeccable – the staff, especially the cheery doormen, can’t do enough for you. 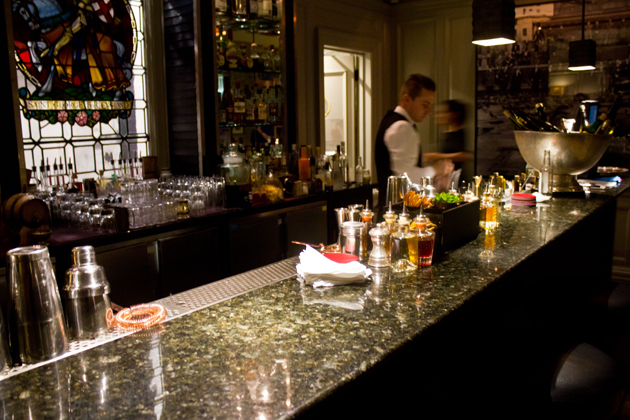 What’s more, the atmosphere feels just right – warm and inviting throughout. If like me, you arrive late on a Saturday afternoon, weary from a long day travelling then your first stop has to be the Browns’ Hotel Spa. I opted for the ‘Spiezia Head in Heaven Treatment’. It involves 75 minutes of back, shoulder, head and face massage with the Spiezia brand of aromatherapy oils. These are a hundred percent organic, handmade in Cornwall and good enough to eat, so my beauty therapist Kelly-Ann informed me. I know what she means but I’d rather savour the house cocktails in the fashionable Donovan Bar. Named after Terrance Donovan the celebrated British photographer, it is a great place to meet friends. 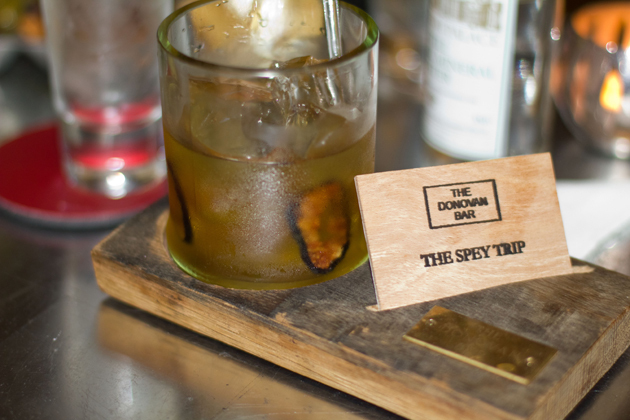 We tried one of the house specialities; The Balvenie Spey Trip. This whisky-based tipple made with rare single malt Balvenie Scotch, is served in a chunky glass tumbler recycled from one of its whisky bottles. The serving block it arrives on once formed part of the original oak cask. There are world-class eateries in the vicinity too; Hakkasan, Cecconis, Scott’s… but you may just want to enjoy the comfort of your room and order in from the HIX Mayfair restaurant located on the ground floor. Founded by gastro king, Mark Hix, the eatery specialises in the finest quality British ingredients including, Morecambe Bay shrimps and Aberdeenshire beef and the room service menu has a great selection of light bites to chose from. In the morning speak to the Concierge Edmund Conway or Amr Fadl on how best to plan your day. If you are a keen runner ask for the Browns jogging map, which illustrates routes around Kensington Gardens, Hyde Park, Green Park and St James Park. All that exertion will make you appreciate the breakfast/brunch at Hix even more. Highlights include the Orkney kippers with lemon butter and the Kedgeree, which are both out of this world. A good long-weekend agenda in Mayfair is to immerse yourself in the art scene or go shopping. Step out onto Dover Street and head for the aforementioned Dover Street Market. Just a few doors down is Wolf and Badger, an independent boutique, which stocks new labels with a crafty edge. A visit to Victoria Beckham’s new flagship located at number 36 is an absolute must. Stark and sleek it has the feel of a contemporary art gallery, complete with seating benches where you can pause and admire the clothes, which hang like works of art on zigzag-shaped rails. Meanwhile Albemarle Street houses more stylish gems such as Amanda Wakeley, Paul Smith and British luxury leather goods brand Globe-Trotter. The latter has an array of handmade luggage should you need to upgrade your travel essentials before heading home. Time for some culture? There are plenty of private and independent galleries closer to Brown’s such as the Albemarle Gallery on Albemarle Street. It specialises in painting and sculpture from international and UK based artists. 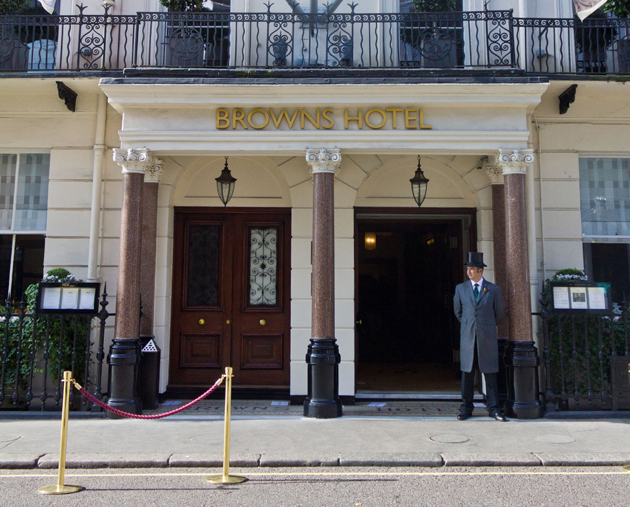 Founding director, Tony Pontone, also gives guided tours of the capital’s leading galleries to guests staying at Brown’s. Meanwhile the Frieze Art Fair (October 15-18) is the place to spot new talent and even bag a good investment from its temporary home in Regents Park. Finally on a sunny autumnal day, Hyde Park is ideal to stroll in or if you are game, why not take a pedalo out on the Serpentine? It might sound corny but it is great fun. You could of course head back to the modern, yet cosy tearoom at Brown’s Hotel, where a glass of R de Ruinart Champagne and some freshly baked scones are the order of the day. This season designers take their cue from Pop Art and make light of accessories with aplomb. It’s all about the whimsical and the quirky with pieces ranging from Moschino’s ‘Happy Meal’-inspired shoulder bag to Pierre Hardy’s lash-motif heels. But as far as talking points go, Anya Hindmarch’s coveted leather tote bag (£1,350) from her ‘Counter Culture’ collection is a sure-fire collectable. Embossed with the ‘Ship Matches’ motif, it is bound to light up any autumn ensemble.